M. Night Shyamalan's Wayward Pines is scheduled for a fall debut, but Fox brought the pilot episode to San Diego Comic-Con to give a select few an early preview. The trouble is, in this case, being one of the select few wasn't cool. The show stars Matt Dillon as Ethan Burke, a secret service agent assigned to track down two missing colleagues. However, just as he's getting close, he gets into a car crash and wakes up in the tiny town of Wayward Pines with none of his belongings, surrounded by bizarre characters and unable to get out. It's not a bad idea by any means, but a good idea still won't execute itself. The concept's got potential. There's only so much information you can get across in a single episode, but the pilot offers up enough twists and turns to suggest that it could go to some extreme places with nearly no limitations. It's got a good cast. When a show stars Matt Dillon, Melissa Leo, Toby Jones, Carla Gugino and Terrence Howard, you pay attention, and there definitely is a thrill to seeing them pop up throughout the narrative. The characters are completely wooden. Yes, it's neat seeing Leo step in as a creepy nurse and Dillon play a rough and tough secret service agent, but that's where the fun stops. Once the show conveys the basics on its main players, that's it. They simply are who they are and don't grow the slightest bit. You can't connect to the characters. Half the fun of a situation like this should come from walking into this bizarre world right alongside an unknowing and more grounded character like Ethan, but instead, you're merely watching him do it himself. Characters are making big decisions all over the place, especially Dillon, but you're not in touch with their thought processes in the slightest, so it's impossible to understand why they're making any of those choices, and that makes it hard to care about everything. It's repetitive. You know what's frustrating? Watching Ethan's wife walk off to take a phone call and find out about Ethan's car accident only to walk right back over to her son and then explain that she just got a phone call and his father's been in an accident. 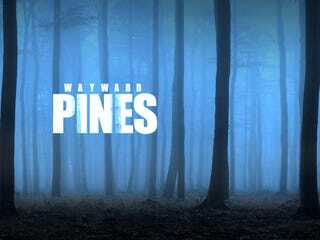 Wayward Pines is absolutely ridden with repetitive beats and story details. Almost every single scene that takes place in the Wayward Pines-set portion of the show progresses in the same exact fashion – Ethan meets someone new, they're oddly cheerful, but then become eerie and manipulative. It works well enough the first time around, but when the show starts playing that same game over and over again, it becomes predictable and dull. The pilot's got zero momentum. Simply put, this thing's boring, and that's a direct result of the character and repetition problems. The central idea is interesting and the pilot does expand it a little, but not in a way that builds any tension. There's lots of lame dialogue. Leo's character is meant to be a bit off — along with every other resident of Wayward Pines for that matter — but even so, when she tells Ethan she'll try to track down his personal belongings and is stuck spitting out lines like, "I can certainly put on my Nancy Drew detective hat and look into it for you," you feel for her. And the same goes for Dillon when he's forced to order a burger, "bloody, no onions" with a Batman-style growl. The flashbacks are too disorienting. The majority of Wayward Pines takes place in Wayward Pines, Idaho, but on occasion we cut to Ethan's wife and kid who are back in Seattle, Washington. That's fine, but when you put flashbacks in the mix as well, it can take a moment too long to figure out where you are location-wise and then also whether you're in the past or present. Even after being disappointed time and time again, I've still got a soft spot for Shyamalan. The Sixth Sense, Signs and even The Village (or at least the first three quarters of The Village) have been watched and re-watched more times than I can count. I'm willing to give just about anything he touches a shot – but now my job is done. I tried Wayward Pines and coming up with items for "The Good" section of this post was a chore. There isn't a single redeeming quality that makes me think it might be worth watching more of this show. However, when the screening wrapped, there was a moderate applause. But perhaps that's because Shyamalan and the large majority of his cast were coming into the room. Dillon, Leo, Jones, Gugino, Reed Diamond, Shannyn Sossamon, Tim Griffin and Charlie Tahan were all there, but we barely got 10 minutes with them. Then again, more time wouldn't have made much of a difference because no one was saying anything about the content in the show. I get you need to keep your secrets, but why hold a panel at all if you can't discuss anything? At least Shyamalan offered a little bit on why he was drawn to the project and what we can expect from it. First and foremost, Shyamalan dug the mixture of black comedy and suspense. It's an offbeat pairing so, in turn, we get a pretty weird world, but Shyamalan insisted, "They're all acting weird for a reason, which you find out as the show goes on." Shyamalan also pointed out, "We made an interesting decision, I think a pretty bold one, that we weren't gonna hold back the answers for the whole series so we made a really bold decision to tell you guys everything as we go, midway through." He added, "We actually believe when you understand what's happening, it's just as interesting and so I don't want that to be, 'Thank you. Goodbye,' but, 'Now let's talk about that.'" Eight and a half minutes of talking about Wayward Pines was enough me, but thanks anyway.